Authorities had to remove a huge 8-foot gator from a garage in Naples, Florida, and the alligator did not go quietly. Authorities have captured a monster alligator that had snuck into a Florida homeowner’s garage. It was found in a garage at Valencia Golf and Country Club in Naples, according to local news reports. The astonishing video is embedded at the bottom of this post. Florida Fish and Wildlife Conservation Commission officials were able to lure the 8-foot reptile out of the garage eventually, but it trashed and hissed at them as they tried. 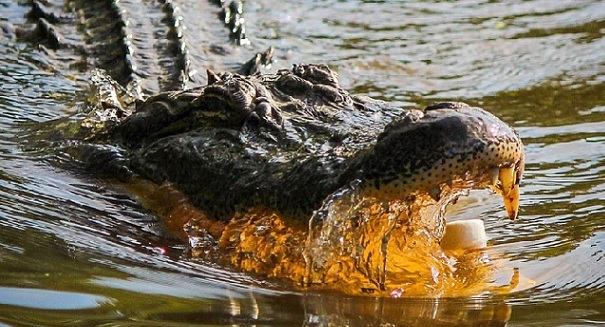 They were finally able to clamp down the alligator’s mouth, and then remove it from the area. No one is sure how the alligator got into the garage, but gators are certainly not an uncommon sight in Naples and Florida statewide. There are an estimated 1.3 million alligators that live there, although many live in the Everglades which is largely uninhabited.